You may be thinking that it is somewhat counterproductive for me, a wedding stationer, to write a blog post about eloping; I mean, elopements don't tend to encourage the need for a whole load of invitation sales do they?! But here's the truth, I like to help people and if that means that this post helps a couple realise that the 'traditional' route isn't for them, then that is okay with me. You see, I know a fair share about elopement because, well, Joe and I did exactly that, albeit we didn't just disappear, get married then tell people, they knew in advance! We had known for a long time that we both wanted something low budget and relatively fuss-free. We looked into various options, but neither of us particularly favoured any option we explored; other than the eloping thing nothing really felt like 'us'. Having settled on the elopement plan we started looking at our options, starting with Cornwall as our dream location (we were living near Salisbury at the time) because we both wanted to live there someday, plus it was where we got engaged too. We finally found the perfect place, Boho Cornwall, which specialises in elopements and was not too far from the beach where we got engaged, and proceeded to book our wedding! The day itself was perfect. We were on our own in our little Boho Cornwall apartment, Ochre, until our photographer, Adam Gibbard, arrived (who was absolutely awesome!) and then we walked the few paces to the main ceremony within the beautiful arts and crafts house. The owners, Tom and Maya (also our witnesses! 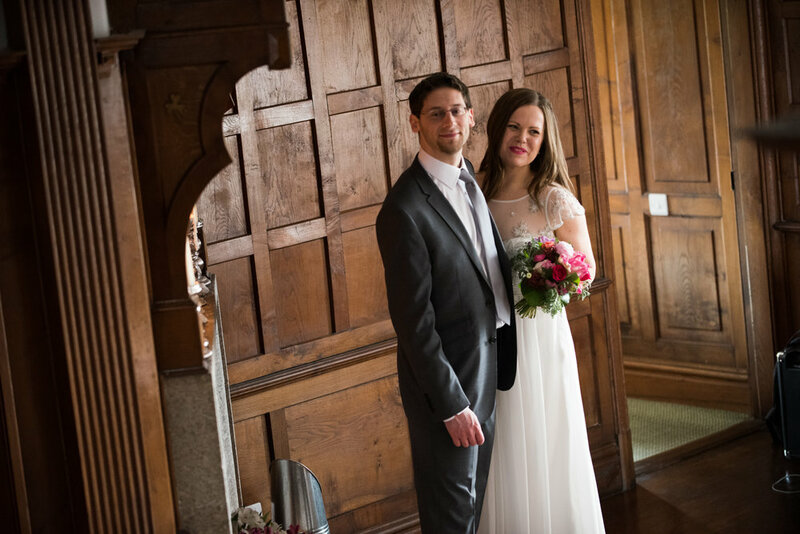 ), played our chosen music whilst we walked down the candle-lined, wooden staircase into the room where we became husband and wife. Post-ceremony we went off with Adam to a couple of locations for more photographs and arrived back late afternoon, where we made tea and relaxed in peace and quiet, reflecting on our day. The fact that all we had to worry about after our wedding was making our evening dinner reservations was perfect; there was no rushing, no stress, just the two of us and gorgeous views of Cornwall and the sea. Do I think I would have enjoyed something bigger, with more people and a good old disco late into the night... hell yes! But, for Joe and I, at that particular time of our lives it was just what we wanted and what fit with our lives and I can speak for both of us here when I tell you that we have zero regrets about it. We talk about it all the time and we have such lovely memories about the experience. Of course, there are ways to meet in the middle, somewhere between traditional and eloping and, to some people that is a registry office ceremony and a huge party or family meal or any other option in-between, so there is always room for creativity if you aren't necessarily watching the purse strings; it doesn't have to be something you look upon as an isolating experience at all, you just have to make it what you want. If you are considering elopement as an option I would highly recommend that you and your partner sit with a pen and paper and write a list of pro's and con's for every option available. Once you have made your decision just stick by it, don't be swayed by anything other than what the two of you want. If you think eloping is for you then you may be interested in my free printable list of all the things to consider if you are planning your day, just click right here to get your freebie right to your inbox. Finally, I thought I would link a video that I made three years back, just after we got married, all about our experience. It may be old but it also may help!